Looking for a group to join? Have some spare time on your hands? Looking to give back to the community? All good reasons to Join Our Crew! 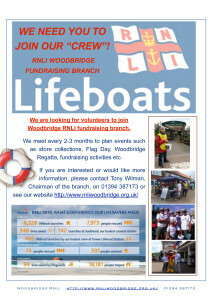 We are looking for people to join our team of RNLI fundraisers in Woodbridge. Please see the poster below for more details and get in touch or come and see us at our AGM on 20th April. This will be held at the Bell & Steelyard at 7.30pm.